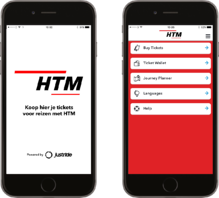 London, UK and The Hague, The NetherLands - July 6th 2017 – Masabi, the global leader in transport mobile ticketing and innovative fare collection, today announced that it has deployed mobile ticketing on trams and buses to HTM Personenvervoer NV, the public transport company for The Hague, in The Netherlands. The service is now live across the cities’ 17 lines, which account for more than 90 million euros in fare revenue per year. Masabi has deployed JustRide, its award winning, end-to-end mobile ticketing system operating in cities around the world. In The Hague passengers without an OV Chipcart previously had to purchase single-use and day tickets, available as disposable smart cards. These tickets cannot be reused and must be bought either on-board or from vending machines at stations throughout the city. JustRide allows passengers to buy tickets anywhere, anytime on their smartphones using an application with support for Dutch, German and English, and payments using IDEAL, the popular Dutch payments system. As a part of the deployment, JustRide also ‘deeplinks’ to the HTM trip planning application, allowing real-time A to B route planning and service updates to be accompanied by the option to seamlessly purchase and store transit tickets on passenger devices. The ticketing app is available for download from Google Play and the Apple App store.